I ran across a painting from a couple of years ago, and remembered I had done photos during the process, for a future blog. I am now posting it, with some "hindsight is always 20-20" comments! This is using a photo from our trip, in 2015, to England. We stayed at a wonderful series of B and B's, some were "Pubs with Rooms" and all were very special in their own way. This was called "Green Hope Guest House, in northern Yorkshire. 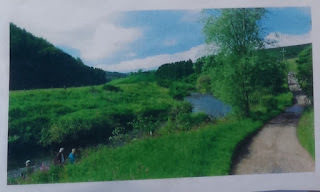 It was back a LONG farm track, but when we got there, it was a gorgeous stream-side garden-strewn home. I took this photo looking back along the stream, toward the pastures and treeline, early morning, the day we left. This is the reference photo. The road on the right fords crosses a little rivulet, then up a hill on the way out of the farm. Those people are our friends, David and Diane, with whom we did our 2500 mile driving trip all over England and a little bit of Scotland. 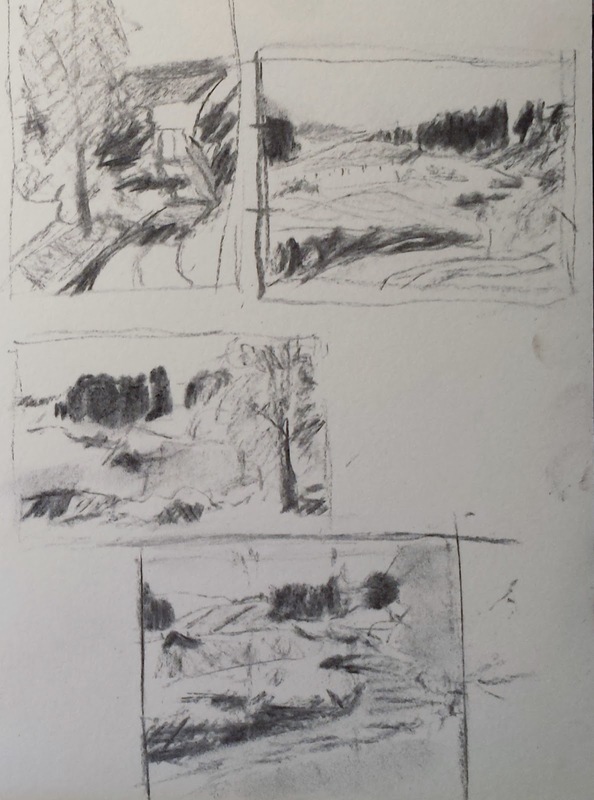 I knew I did not want to paint the whole view, too much going on, so I did a few thumbnail sketches to get the value shapes I thought would work. The one on the upper left became two other paintings, but I decided for this larger one, I wanted the one at the bottom of the page. Step 1. 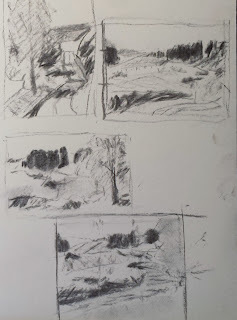 Thumbnails. I chose the sketch which shows just a bit of the treeline on the left, the lovely stream, and the fields, with a hint of a fence, above the darker stream bank. It is a river, actually, but I forget its name! 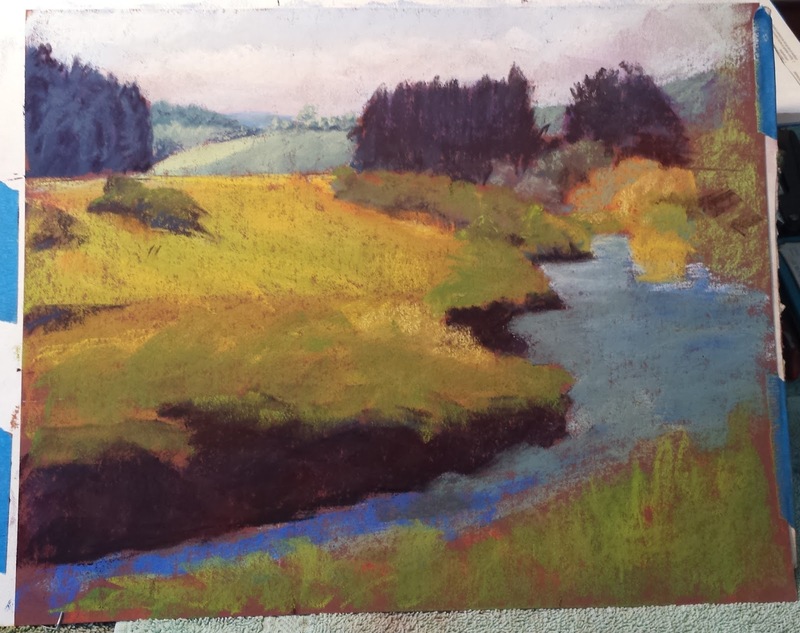 Next I did an underpainting, using complimentary colors so the mostly green scene would have a little "punch. Step 2. I am using complimentary colors, painting the warmer reds, yellows on the foreground, and the cooler blues and purples in the background, to emphasize the distance. These will be seen in little glimpses, under the many greens of the picture. Step 3. 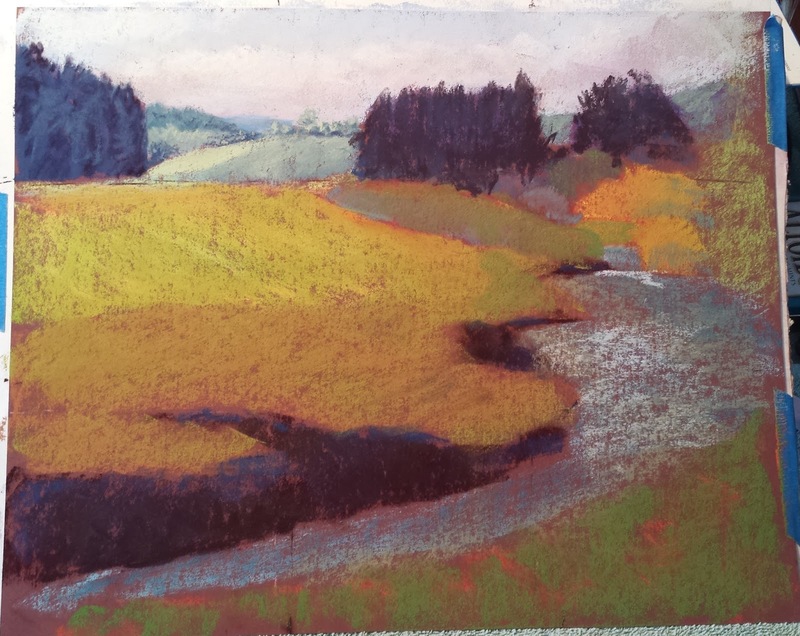 Beginning to apply more pastel in the local colors. You can see I have begun to block in the sky. It was a day with mixed sun and clouds, but , as for the whole trip, a mostly sunny day, later on, as we made our way to Edinburgh. I had decided I did not want this painting to be just GREEN, so I am going to underpaint warmer colors to begin. Step 4. 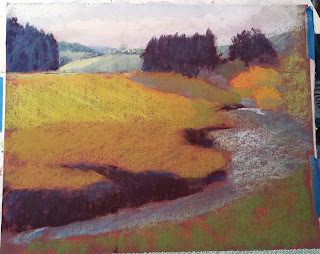 Here I am using warm yellow ochre, other warm yellows, and a little dark reddish violet, in the closer fields and stream bank, with a little yellowish green on the near bank, where there are a lot of shrubs. I have also blocked in the light blue haze in the distance, and some cool blue greens of the far stands of pine trees. 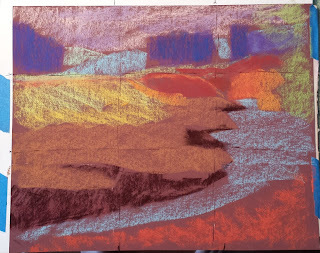 I will continue to add color, to build up the pastel to where I think I will finish with the greens. Step 5. I am working to make the scene feel warm and mellow, with the use of all the rich yellows, yellow-greens, and greenish blues . I have also put in the blues of the river water, and a little more definition of the shrubs along the stream in the back right, at the river's curve. NOTE; When rediscovering these photos of the steps for this painting, I am really regretting having taken this painting any further than this stage. 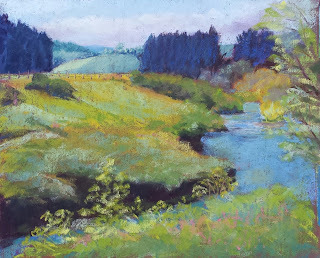 Two years later, after much study , workshops, as well as two more years of teaching my pastel classes under my belt, I see that THIS is the painting I had wanted to do! I jave been struggling with leaving detail OUT of my work, letting the feeling of the place reign, rather than the worrying the little details to death! Step 6. However, I DID continue on this painting, and here is the final result. 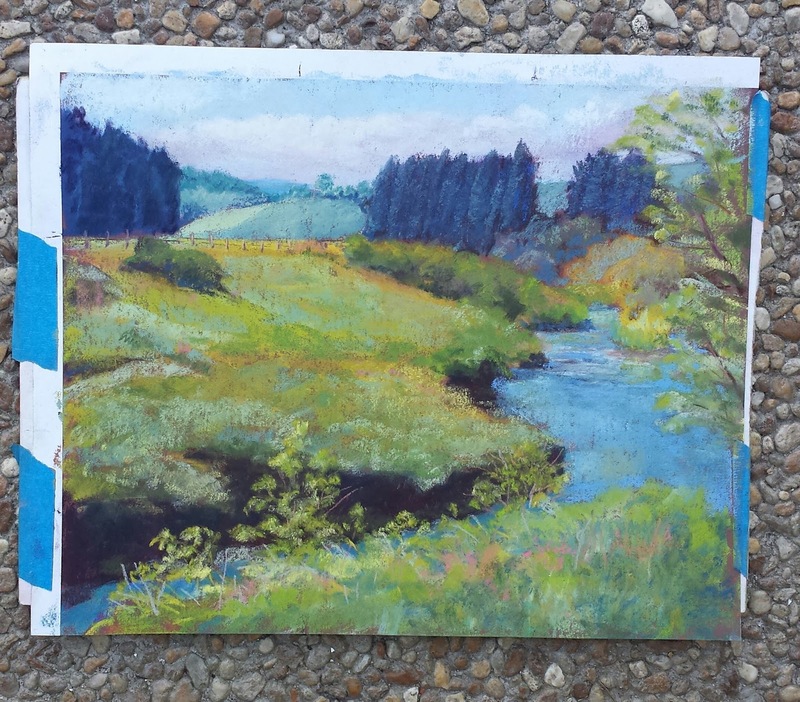 I built up the warm greens of the grasses, the cooler, darker blues in the background, and added details of shrubbery, the right foreground tree, and some flowers. Not sure which I like best, but since the Step 5 one no longer exists, other than beneath the finished one, I guess I have to be happy! Maybe I will do a whole new painting! For those who are interested, I painted this on 400 Uart sanded paper, with Terry Ludwig pastels.